The 2016 production is Twelfth Night, which tells the tale of a young girl named Viola, separated from her twin brother in a shipwreck and left all alone in a strange land. Resilient, Viola adopts a male disguise and enters into the service of Duke Orsino—only to find herself right in the middle of a triangle of unrequited love. 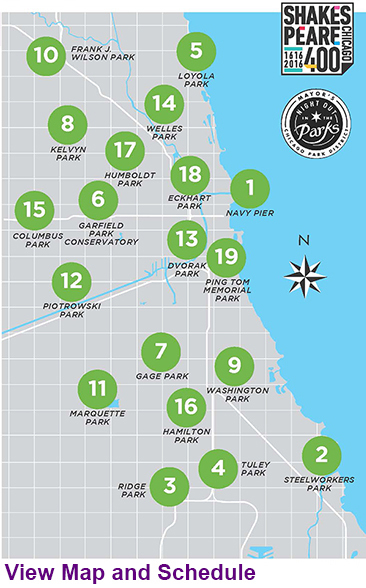 It will tour to 18 Chicago parks from July 14-August 14, 2016. In its fifth anniversary year, the FREE FOR ALL Chicago Shakespeare in the Parks tour is the largest citywide event of Shakespeare 400 Chicago—our yearlong celebration of the playwright’s 400-year legacy. This free 75-minute abridged production of Twelfth Night is coming to neighborhood parks across the north, west and south sides of the city. At each tour location, a specially equipped truck rolls into the park, a stage unfolds, and a company of professional actors shares Shakespeare’s jubilant, music-infused romantic comedy with families and neighbors of all ages. The citywide tour is made possible by a renewed civic, cultural and corporate partnership between Chicago Shakespeare Theater, the City of Chicago, Chicago Park District, Boeing and BMO Harris Bank. Since the inception of the Chicago Shakespeare in the Parks program five years ago, more than 80,000 Chicagoans have taken advantage of free performances in their communities. See where Chicago Shakespeare in the Parks 2016 is taking place in the city and plan where to meet up with your friends and family this summer. Every Chicago Shakespeare in the Parks performance begins with a Green Show featuring local artists reflective of their neighborhood’s dynamic spirit. Joe Ward of DNA Info explores how Chicago Shakespeare in the Parks is playing its part in South Chicago's cultural revitalization.